The first ever Myntra Fashion Weekend was hosted at Palladium Hotel in Mumbai where stars from bollywood showed their fashion and style. The finale of the three-day event had both fashion enthusiasts and Bollywood buffs at the edge of their seats in anticipation for cinema heartthrob Hrithik Roshan's newly launched brand HRX. Hrithik Roshan walked the ramp on the last day of the event where he was an absolute delight to watch in a brown pants matching his side-curled hairstyle, and paired it up with white t shirt and black overcoat with a cross necklace and some bands on his hand. The leather shoes only completed his look. The Fashion show audience witnessed an energetic and grand performance by bollywood renowned choreographer Sandip Soparrkar's troupes. The dancers brought on ramp dynamic award winning moves which were inspired by Hrithik Roshan film "Kites". Sandip Soparrkar had choreographed Hrithik in the famous song "fire" from Kites film. 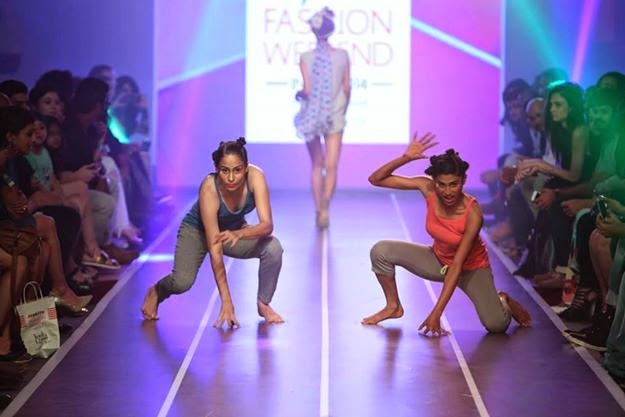 The dance choreography was breadth taking as they presented dance on the ramp and introducing it as fashion. Sandip Soparrkar on his facebook page posted "glad I worked with Hrithik again, he launched his new clothing brand HRX and I am happy to recreate his moves from our song Fire from the film Kites." Hrithik Roshan who was very impressed with the moves and appreciated the work put in by Sandip and his team. The show had everything for which Hrithik’s wildly applauding fans love him. The zest and energy in the room was so high that the show area was over flowing with people shouting and cheering for Hrithik.